Socorro -- The Revillagigedos Archipelago, more commonly called Socorro, is located in the eastern Pacific Ocean approximately 250 miles south of Cabo San Lucas, Mexico - at the tip of the Baja peninsula. Because of the big animal encounters they provide, these islands may be compared to the Galapagos Islands in Ecuador or Cocos Island in Costa Rica. The Revillagigedos Islands consist of four islands - San Benedicto, Socorro, Roca Partida and Clarion. Together they are simply called Socorro. These islands are wild, remote and unpredictable and have been called the Mexican Galapagos. Giant Mantas -- Socorro is famous for up close and personal encounters with the Giant Pacific manta ray, which can grow to 22 feet from wingtip to wingtip. The Solmar V has been interacting with these gentle giants since 1992 and as a result, they have extensive ID's on most of the individual animals and special relationships with many of them. 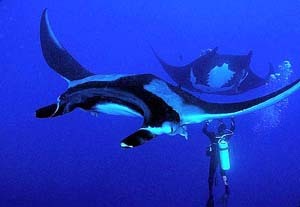 There is no chasing or riding the mantas, rather interactions are initiated by the mantas themselves. San Benedicto is one of the best locations in the world to experience and photograph these gentle giants. The feeling of a wild animal this large deliberately interacting with you is something you will never forget. 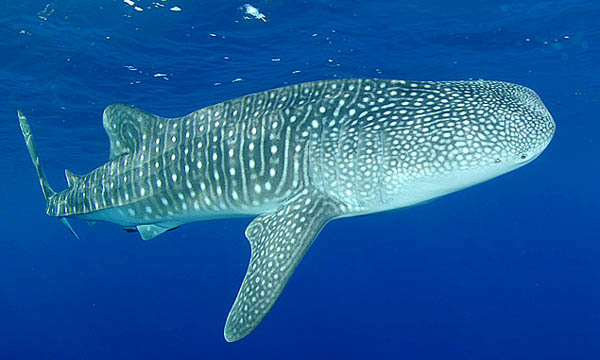 Whale Sharks -- Island Dreams has selected the prime season for this Socorro adventure. At this time of year, we will expect water temperatures of 76-80 degrees F., with plentiful manta rays and schooling sharks. There are lots of sharks in the Revillagigedos Islands - hammerhead schools, white tips, silver tips, silkies, duskies, Galapagos and occasionally tigers. There are several hammerhead cleaning stations that we will visit. 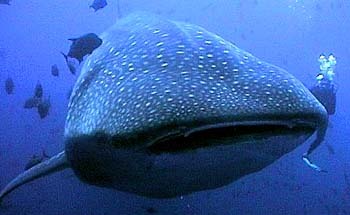 Whale sharks are a special treat around Socorro and are expected during November and December. K.I.S.S. Package -- As opposed to Island Dreams' usual fare of exotic long-haul Pacific trips, Cabo San Lucas is easy and inexpensive to get to. As guests will be coming from around the country, our package price includes only the cruise and tax. Airfare to Cabo San Lucas (San Jose del Cabo, airport code SJD) is not included in our price. No overnight lodging is pre-packaged, as some guests will be able to fly in the same day that cruise departs. You simply must arrive on a flight that lands no later than 1:00 p.m. At the end of the cruise, we will be off the boat by 9:00 a.m., so it will be a simple matter to fly out anytime that same day, morning or afternoon. Airport Transfers and Hotel Overnights -- No airport transfer or overnight lodging is included in the cruise price. Round-trip airport transfers are expected to cost $30-35 per person. Luxury lodging at the Solmar Suites is approximately $250 per double room per night, taxes included. A good room at the Quinta del Sol Best Western is approximately $100 per double room per night. Island Dreams will be glad to assist you with any airline ticketing, lodging, and transfers that you may require. Saturday, December 12, 2009 - Day 1: Arrive at San Jose del Cabo, airport code SJD, no later than 1:00 p.m. If need be, arrive the night before. Solmar V will depart from Cabo San Lucas about 4 p.m., making the initial long crossing to San Benedicto Island. Day 2: Arrival at San Benedicto about 1-2 p.m.(crossing takes 22-24 hours). The remainder of the afternoon is spent diving. Day 3: This day is normally spent diving around San Benedicto, and considering weather possibilities for a crossing to Roca Partida. After sunset, the boat departs to Socorro Islands - this crossing takes 4-5 hours. On occasion if weather looks good we might decide to try Roca before Socorro. Day 4: Arrival Socorro Island early a.m. then quick check in at Navy Base for clearance. Most of this day is spent diving around Socorro Island. If conditions are good here, we might stay another day, but usually depart back to either San Benedicto ot Roca Partida after sunset. Day 5: Arrival early a.m. to San Benedicto or Roca Partida, with diving all day. Days 6 and 7: These days are spent diving numerous sites around San Benedicto and/or Roca Partida depending on weather and if we have been able to get to Roca Partida previously. Both islands are known for most of the large animal encounters on our trips. Departure after a full day of diving on day 7 back to Cabo San Lucas. Day 8: Arrival to Cabo San Lucas after a 22+ hour crossing, depending on weather conditions, which means the boat usually arrives after sunset on this day. Guests overnight on board Solmar V, in port, and disembark the next morning after breakfast onboard. The dockage has a great location near town for those who want to get off and stretch their legs or visit the local night spots. Sunday, December 20, 2009 - Day 9: All clients must disembark after breakfast no later than 9 a.m. The crew will help you with your bags and in arranging airport transportation. 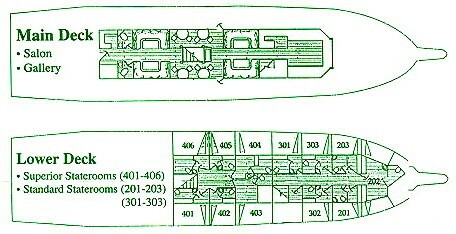 This is a general itinerary that is adjusted on a trip by trip basis according to weather and marine life. The experienced Captain and crew of Solmar V are familiar with the changing conditions, and will use their knowledge to maximize your BIG animal experience.